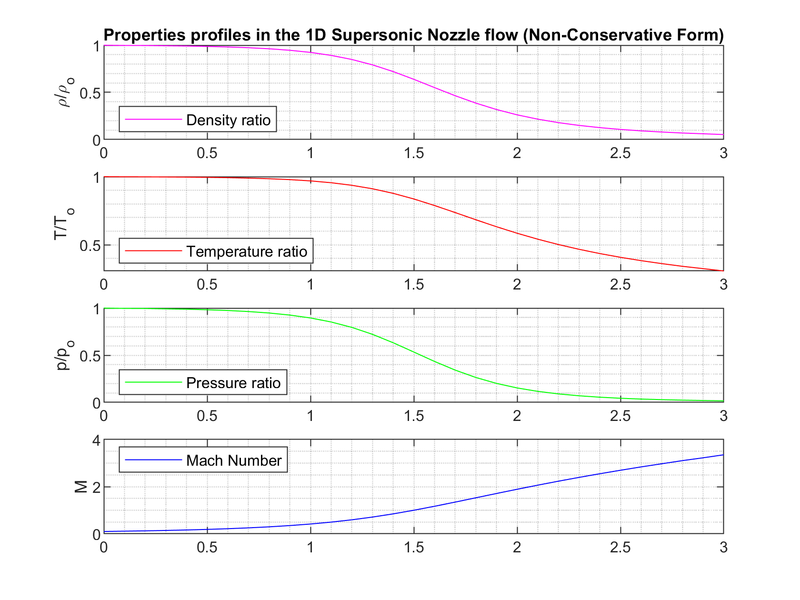 This project main objective is the numerical solution of a 1D Supersonic Nozzle Flow using the Macormack Method. Although analytically identical, the numerical solution of conservation and nonconservation forms of the governing equations is usually different. That is the reason why both ways are solved and compared in this project. For that, the number of iterations and computation time will be compared, as long as the final profile for the normalized mass flow rate. During this project,both a grid dependence test and a CFL-based adaptative time loop control was programmed to assure the fidelity of the numerical results. The conservation and nonconservation equations are analytical identical. Both come from applying the integral conservation method to the control volume represented by the nozzle, and therefore the analytical solution is identical. However, in numerical analysis, the two sets of equations cant be used indistinguisible, and a deeper analysis must be carried out depending on the problem. As a general rule when the control volume is fixed in space with the fluid moving through the governing equations will be in conservation form. However, when the control volume is moving with the fluid in a sense that same fluid particles are always remain inside the control volume, the calculation will generally performed in nonconservation form. The derivation of these sets of equations for the current problem is not in the scope of this project. This derivation is pretty simple and can be found in any fluid mechanics book. In needed, the full derivation and the equations themselves can be found at the Chapter 7 of the book: John D. Anderson Jr. Computational Fluid Dynamics: The Basics with Applications. 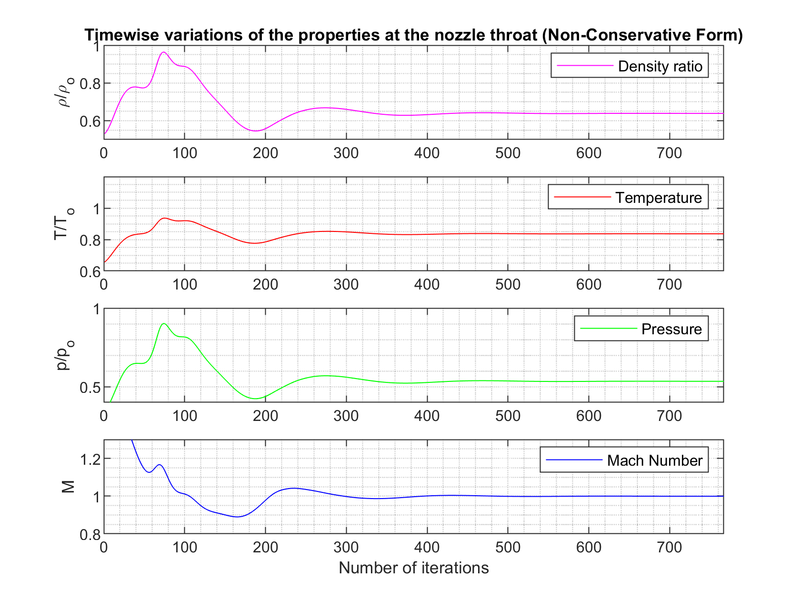 This section shows the variation of the main properties at the throat during the iterations. The purpose of this section is to see the stability of the scheme, and to notice any strangely high or low results in the steady values. The non-dimensional values of the properties at the throat are well-known and that is why this section was chosen to check these calculations. Here, the stability of the nonconservation form solver has been demosntrated. The slight disturbances during the first few iterations are soon dumped and the solution becomes stable. Although it will be compared lately, here we want to hihglight the coherence of the results, as the Mach=1 is achieved at the throat, as it was supposed to be. 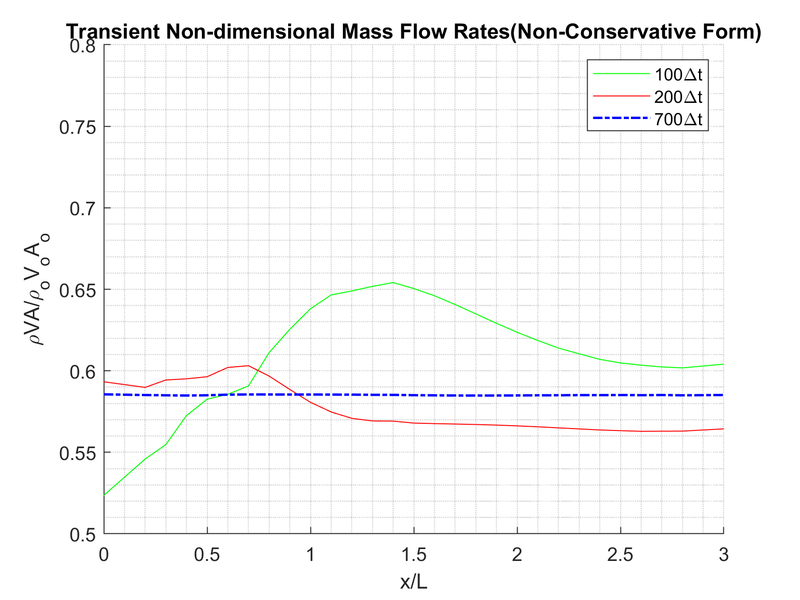 Another useful parameter to check the solution convergence is the normalized mass flow rate. Under steady conditions, the mass flow rate of the nozzle should be constant at any of the nodes. This is actually the error parameter that was used to check for convergence in the time loop. Here, note that the first dashed curve is the variation of the profile at the initial conditions. The strange looking is simply the product of the initial values given to the density, velocity and the parabolic variation of the nozzle area ratio. Note that after 50 times setps, the mass flow has considerably changed, and it keeps changing radically until around 200 steps. In here, we can see that the solution is approximating to the final solution. 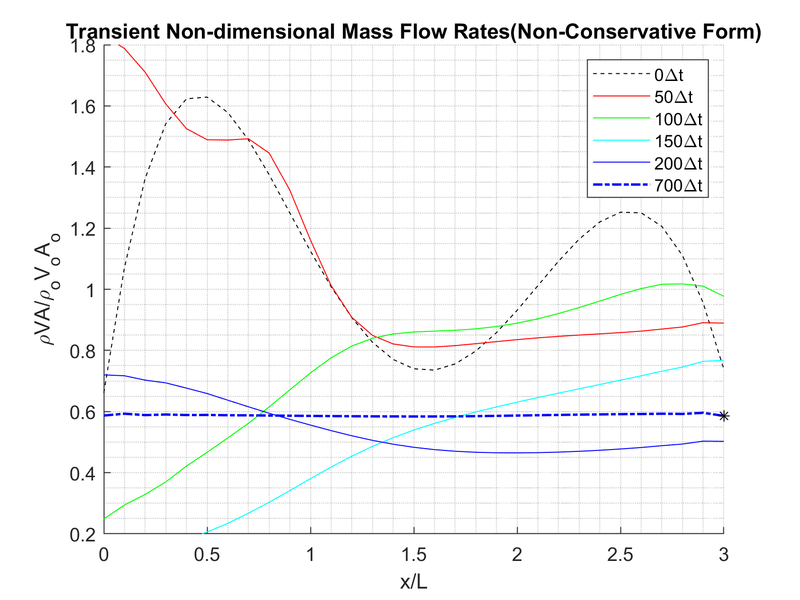 Around 700 iterations were enought to achieve the almost-constant mass flow rate profile. Also note that this convergention was to values really close to the analytical result of 0.579. Once the solver was tested to be stable, the final steady profiles were computed and are shown here. 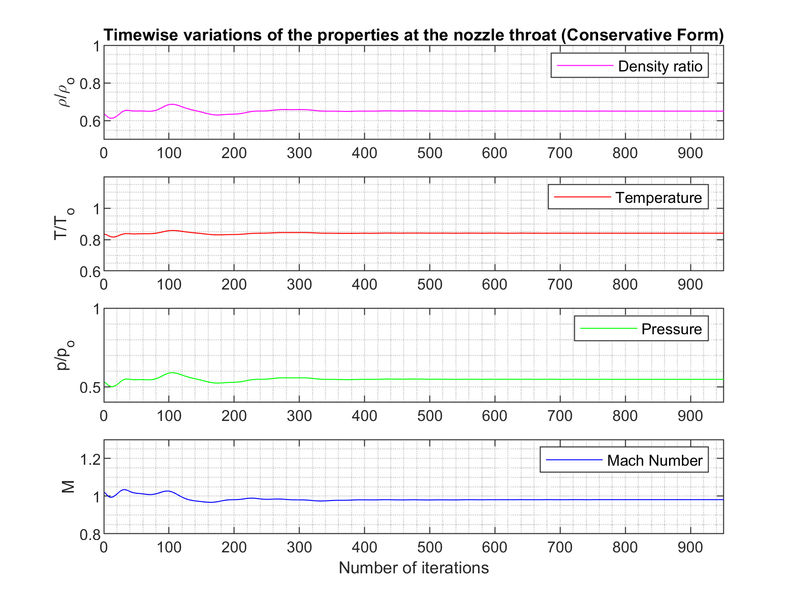 What we can see in these graphs, is that they follow the tendency expected at a nozzle working under these conditions. 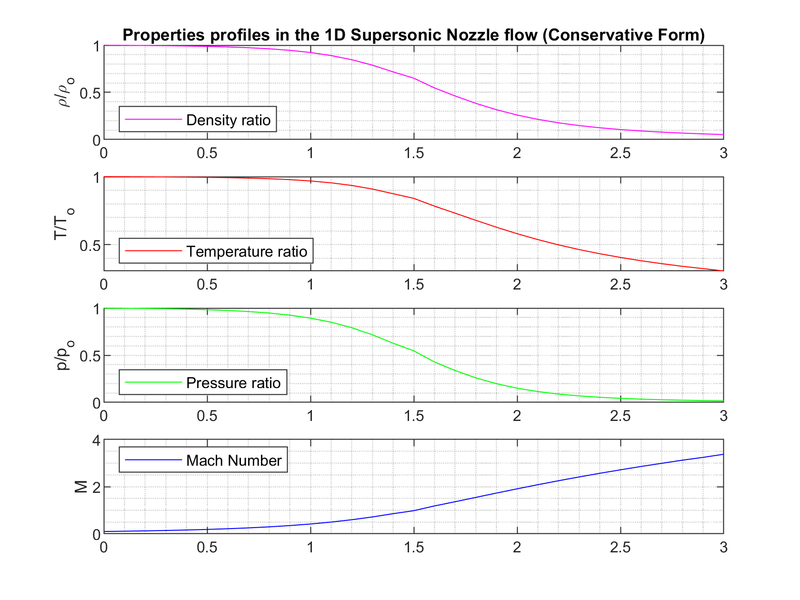 The density, temperature and pressure are dropping through the exit of the nozzle, at the expend of an acceleration of the fluid (increase in the Mach Number). Although no compared here, these results are almost identical to the analytical solution of the problem, listed on the Reference book. As in the nonconservation solver, this section was used to check for convergence in the numerical scheme. Note also that the change until the steady solutions does not go through the same path. That is because of the different numerical schemes (iteration solvers). We can see that the properties are stable real soon in the simulation. The number of iterations is however higher, because the convergence condition was stated in the mass flow rate instead of these parameters. Again, the solution is stable and it seems to achieve promising results. 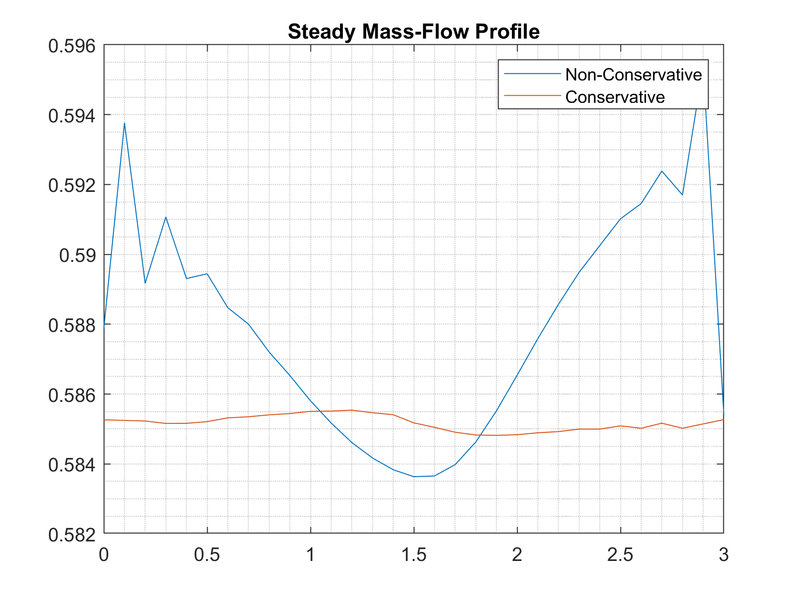 Once again, the mass flow rate profile provides us an extra insight to the mechanics of the timewise variation of the flow and its approach to the steady. In here we can appreaciate that the solution converges in a softer way than with the nonconservation solver. Even from the beggining, the initial conditions lead to a more similar profile to the solution. In here, it can be seen that the computation time needed for the conservation solver is a bit higher than to the nonconservation scheme. However, it does not seem like an important difference that would make one decide for one of them, things like accuracy and stability should be checked first. The stability of both schemes is undenniable. Although both seem to be reliable, it is now time to analyze accuracy and time, in order to decide if there is a more fitting scheme for this application. In here, the steady mass flow profiles are compared. This figure illustrates a general advantage of the conservation form of the equations. This forms always does a better job of preserving math throughout the flow field. This is mainly because the mass flow itself is one of the variables at the equations. This does not mean that the conservation form is a better fit for the numerical scheme, as it will be seen in the following section. The previous discussion does not neccesarily mean the superiority of the conservation form, and further analysis must be done. In this path, the grid dependence test is usually critical to decide whether a problem can be solved faster with one numerical scheme or another (or if just can be solved with them). This test consists on changing the number of grids on the mesh, to check if the results are dependent of the number of points. Any numerical scheme should has as an objective manage to find grid independence. In this case, we change the numer of grids from 31 to 61, and performed the same calculations. The result, showed in the table below, stated that the problem is already independent of the number of computation points taken in the control volume, at least to the precision needed here. Also, this results showed that the nonconservation solver is actually more accurate at computing the primitive variables. Have an awesome project idea? Start working on it and share it with the world.